In the final blog of our four-part special series, we decode the National Student Clearinghouse’s StudentTracker for High Schools’ most important charts and graphs – so you can use the data to discern time until graduating from college. How long does it take for your graduates to earn a college degree? 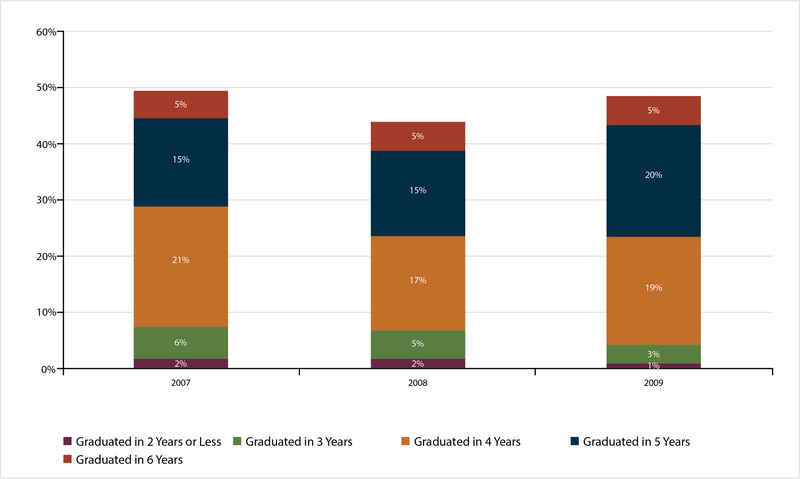 This report shows how many years it took for your school’s college graduates to receive their first degrees (associate, bachelor’s, or higher), from two years or less up to six years. These outcomes are calculated at the six-year mark, so the most recent cohort for your school will be those who graduated six full years ago. Note: “years” in this report refers to academic years since high school graduation. How long does it take for your graduates to earn a college degree? This report shows how many years it took for your school’s college graduates to receive their first degrees, from two years or less up to six years.